Ein Beitrag zur Wangenplastik mit gedoppeltem Halshautlappen. Journal : Beiträge zur klinischen chirurgie ; vol. 4. Tübingen : H. Laupp'schen Buchhandlung, 1889. Description : 621-624 p., [1 l.] pl. ; illus: 1 phot. ; 24 cm. Photograph : collotype on printed leaf. Subject: Cheek — Cancer ; Meloplasty. Nach einem Vortrage im Heidelberger ärztlichen Vereine. Author caption: Von Dr. Prof. H. Czerny. Johann Ritter von Oppolzer, 1867. Assistant to Christian Albert Theodor Billroth, 1868. Associate professor and instructor in surgery, Vienna, 1871. Ordinarius and clinical director, University of Freiburg, 1871. Professor clinical surgery, Heidelberg University, 1877. President, Deutsche Gesellschaft für Chirurgie, 1901. Founder, Institut für Experimentelle Krebsforschung, 1907. President, International Surgical Congress, 1908. GM 3593—radical cure of hernia, (1877). GM 6072—total hysterectomy by the vaginal route (1879). GM 6073—operation for enucleation of uterine fibroids by the vaginal route (1881). Eponym: Czerny's pillar suture for inguinal hernia. Eponym: Czerny's suture—method of intestinal suturing. Photo caption: Taf. X., Beiträge zur...etc. Die Abbildung (vom 22. Januar 1889) zeigt einen ganz normal geformten Mundwinkel und die Oeffnung des Mundes, wobei die Ränder der Schneidezähne etwa 27 ½ cm klaffen. Die der Mundhöhle zugewandte Fläche des Lappens besass zwar noch epidermisartige Bedeckung, war aber rosig gefärbt und frei von Haaren, während an der Gesichtsfläche üppig Barthaare sprossten.—Page 623. Operation for an epithelioma in the cheek of a male subject, a 34 year-old skipper who smoked. 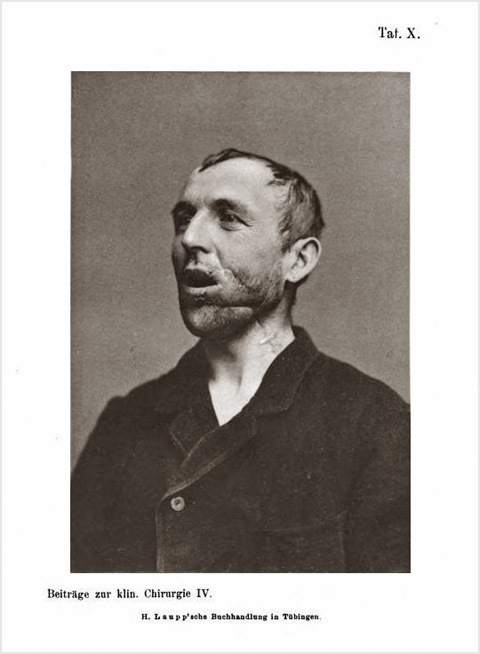 The cancer occupied the corner of his mouth, extended to the masseter, and left a defect 38 mm. in diameter after extirpation, the size of a five mark coin (fünfmarkstück). Czerny cut a long flap (5 x 12 cm.) that he doubled over and sutured into place, the cuticular surface facing inward. Pedicle was situated at the base of the zygomatic arch and the apex of the flap extended as far as the sternomastoid from where it was carried with its platysma to the masseter edge of the defect. A second operation was required to cut into the fold of the flap to shape the corner of the mouth. The paper was transcribed from a lecture delivered at the Heidelberg clinic.